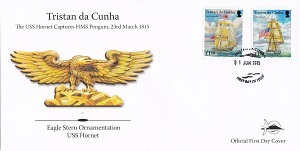 This set of stamps marks the bicentenary of the capture HMS Penguin by the USS Hornet on the 23rd March 1815 off Tristan da Cunha in the last action of the War of 1812 - the last time that the UK and the USA were at war with each other. 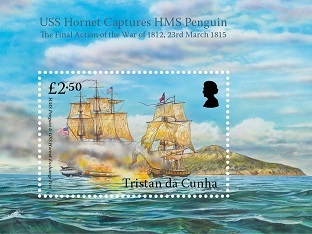 On 23 March, 1815 USS Hornet captured HMS Penguin off Tristan da Cunha in the last action of the War of 1812. The War of 1812 lasted two and a half years and was fought by the United States of America against the United Kingdom and its North American colonies and American Indians. 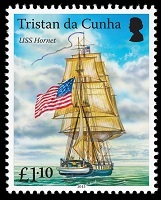 War had been declared by the United States on 18 June, 1812 for several reasons, many connected to the Napoleonic wars; for example trade restrictions that affected America and the impressment of American merchant sailors into the Royal Navy which had expanded enormously during the Napoleonic Wars. At the end of the war both sides signed the Treaty of Ghent 24 December, 1814 and both parties returned occupied land to its pre-war owner and resumed friendly trade relations. News of the Treaty didn't arrive in the United States for a further month when it was unanimously ratified by the U.S. Senate and proclaimed on the 18 February 1815. Master Commandant James Biddle aboard the Hornet was unaware of the imminent peace when he set sail from New York in January 1815. 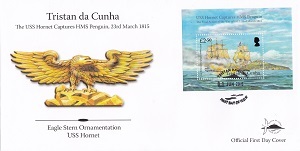 Hornet had carried the final diplomatic messages from Britain and then returned to sea to become the first ship in the Navy to capture a British vessel. In 1813 she sank HMS Peacock and in 1814 she was part of a small squadron (comprising the frigate USS President, the sloops of war USS Peacock and Hornet and the Brig-rigged tender USS Tom Bowline) prepared at New York to attack British shipping in the Indian Ocean. On 15 January 1815 USS President took advantage of a gale to break out of the harbour but was captured by the blockading British squadron. 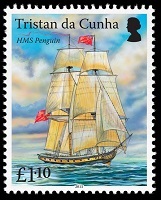 A week later the remaining three ships, unaware of the President's fate, took advantage of another storm and evading the blockaders made for a pre-arranged rendezvous with the President off Tristan da Cunha. During the voyage, Hornet lost touch with the other two vessels. USS Peacock and USS Tom Bowline reached the rendezvous first, on 18 March, but were then driven off by a gale. Hornet, reached the island on 22 March and was about to drop anchor when an unfamiliar sail was spotted. The Cruiser-class brig-sloop HMS Penguin (Captain James Dickenson) was a new vessel carrying the same main battery as the Hornet, 18 carronades (broadside battery) and 2 long twelves (as bow chasers). She had been despatched from Cape Town to hunt down an American privateer, the Young Wasp, which had been attacking homeward-bound East Indiamen. As soon as Hornet was sighted Dickenson prepared to engage and for some 15 minutes the two ships exchanged broadsides. As Dickenson turned to close with the Hornet he was mortally wounded. The two ships collided and Penguin's bowsprit ran across Hornet's deck between the main and mizzen masts, badly damaging the American rigging. Neither made any attempt to board the other and the gunnery duel continued. As the two vessels separated Penguin's foremast fell and unable to manoeuvre his ship Lieutenant McDonald, now in command of Penguin, surrendered. Amazingly not a single British carronade shot had hit the hull of Hornet, whereas Penguin was too badly damaged to be repaired. The Americans removed her stores and hurriedly set her alight when more sails, which turned out to be the Peacock and Tom Bowline, were sighted. The Tom-Bowline took the British prisoners to St. Salvador, Brazil as Hornet and Peacock headed for the East Indies. On 27 April they sighted and headed for what they believed to be an East Indiaman before realising that their intended victim was in fact a British ship of the line, HMS Cornwallis. Recently completed at Bombay from teak the Cornwallis was fast and a chase that lasted two and a half days ensued. Eventually Hornet evaded capture by jettisoning pretty much everything on-board, including part of the forecastle. Without stores, guns, anchors or even the ships' bell, Hornet headed home. Congressional Gold Medals awarded for two spectacular victories made Hornet one of the most decorated ships of the war.